The second utility for managing an Exchange Server 2013 environment is an automation and scripting tool called the Exchange Management Shell (EMS), shown in Figure 2. This shell is a command-line management interface that can be used to administer servers in an Exchange Server 2013 organization. It enables administration of the Exchange Server 2013 environment without the Exchange management tools such as the EMC, albeit via a command-line interface. Built on Microsoft Windows PowerShell 3.0 technology, the Exchange Management Shell can perform any task that can be accomplished in the Exchange Management Console and a lot more. In fact, many configuration settings in an Exchange Server 2013 environment can only be accomplished using the Exchange Management Shell. Figure 2. Exchange Server 2013 Exchange Management Shell. Exchange Server has the ability to access all the familiar Exchange Server cmdlets remotely, leveraging the PowerShell 3.0 remote capabilities. This enables cmdlets and scripts to run across multiple servers in a single EMS instance. It also enables administrators to run the shell from their workstations and connect remotely to the Exchange Server 2013 servers. EMS can run on either 32-bit or 64-bit client systems and connect to 64-bit Exchange Server 2013 servers. The EMS does not require Exchange Server binaries to be installed on the client, making deployment much easier. The Exchange Administration Center is an exciting new tool in Exchange Server 2013. The EAC is a browser-based management client for end users, administrators, and specialists. This provides a new way to administer a subset of Exchange Server features and is completely RBAC-integrated. This new EAC web utility provides a great self-provisioning portal for administrators and a simplified user experience for common management tasks. It is accessible directly via a uniform resource locator (URL) just like email access is accessed by URL to Outlook Web App (OWA). The EAC is AJAX based, deployed as a part of the Client Access Server role, and shares some code with OWA. However, the two are separate applications and sites. The scenarios are configured in the RBAC interface, which is based in the Exchange Administration Center. Administrators would launch the EAC tool directly from the ECP link (https://<servername>/ecp) where <servername> is an Exchange Server 2013 CAS. Although administrators can switch between their OWA mailbox web page (https://<servername>/owa) and the EAC administration web page (https://<servername>/ecp), the security is integrated and provides separation between the user and administration roles. All that remains of the Exchange Server 2010 Management Console is the tools, so the collection has been renamed the Exchange Toolbox and shows up in the Start menu with the Exchange Management Shell. The following sections describe the tools in the Toolbox. The Exchange Best Practices Analyzer (ExBPA) is included in Exchange Server 2013 and can be found in the Exchange Toolbox. The ExBPA can be used to run health checks on an Exchange Server environment, and can also run performance checks, permissions checks, and connectivity tests to assist when troubleshooting problems. The ExBPA should be run whenever a new server is added to an Exchange Server 2013 environment, or whenever configuration changes are made. 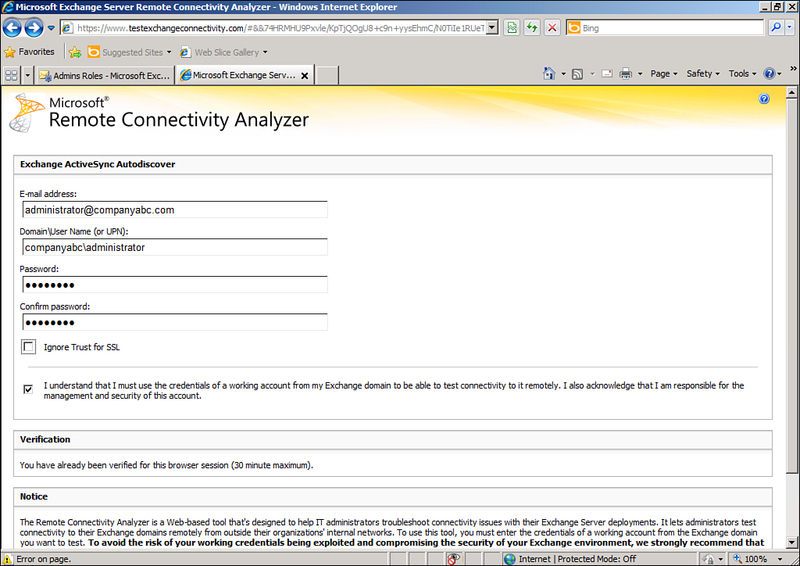 The Remote Connectivity Analyzer (RCA) is also found in the Exchange Toolbox in Exchange Server 2013. The RCA allows administrators to test services from outside their organizations. The tool essentially launches a browser to the website https://www.testexchangeconnetivity.com/ (shorthand https://exrca.com), shown in Figure 3. The website is maintained by Microsoft and is not technically a component of Exchange Server 2013, although the console has a link to it. Figure 3. Remote Connectivity Analyzer website. This site performs a valuable service by testing actual client access from a third party (that is, Microsoft). This simulates a client and exposes configuration or connectivity problems. For example, the Internet E-Mail Tests use SMTP to send email to a user, verifying the MX record, name resolution, SMTP, and if the gateway is an open relay. Another example is ActiveSync Provider AutoDiscover, which tests the notoriously difficult to test ActiveSync autodiscover services. As shown in Figure 4, the site prompts for email address, domain credentials, and verification. On clicking Perform Test, the site tests ActiveSync autodiscover and presents the results. Figure 4. 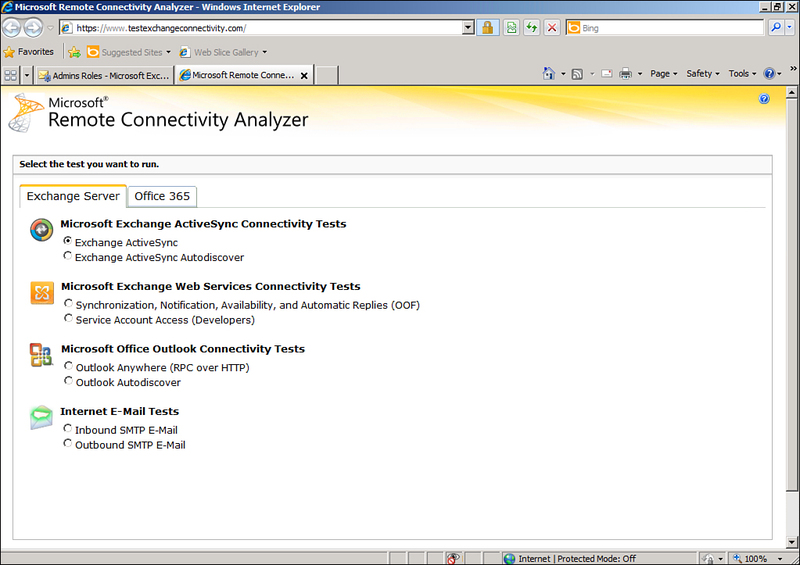 Remote Connectivity Analyzer ActiveSync Autodiscover Test setup. The tool does require domain credentials to test the various services, so security measures are built in to the product. The site uses the HTTPS protocol, so the confidentiality of the transmissions is protected by Secure Sockets Layer (SSL) encryption. The site prompts human verification, reading, and entering distorted text to ensure that the system is not hijacked by bots. And the site has a privacy statement indicating that the information collected is not retained after the tool is used. All that said, it is strongly recommended that dummy test accounts and credentials be used to execute the tests—and that those accounts be disabled or deleted following the tests.